This combination requires that the Blue and Green monks have particular abilities. Blue must have the double-village-tile-or-double-fight ability (Second Wind). Green must have the never-roll-the-curse-die ability (Strength of a Mountain). If you play strictly by the rules, this combination must be drawn randomly, but given the difficulty of Ghost Stories, you may want to allow players to pick their abilities. In the first few rounds, all players may do whatever seems best in the situation. For example, picking up the Buddhas and activating the Circle of Prayer tile are good ideas. Once a couple of the tougher ghosts come out, switch to the Blue/Green strategy below. Blue uses the Sorcerer’s Hut twice per turn to exorcise two ghosts, at a cost of two HP. After the first couple of turns of doing this, Blue will die. Then Green uses the Cemetery to resurrect Blue, and Green’s ability negates the usual cost of rolling the curse die. Blue returns to Sorcerer’s Hut, and the cycle repeats until the boss (the incarnation of Wu-Feng) appears. Yellow will have the job of fighting the lesser ghosts. The Bottomless Pockets ability (receive a Tao token every turn) is probably the better one for this strategy. If the Cemetery and the Sorcerer’s Hut are not adjacent, Red should take the ability to move another monk (i.e., Blue) or use the Pavilion of Heavenly Winds village tile. Otherwise, Red can help Yellow to exorcise weaker ghosts. When playing solo, all the ghosts of your board’s color as well as all the black ghosts have to go on your board (unless your board is full). The black ghosts can be some of the worst! I try to keep a Buddha on my board as much as possible in case a bad black ghost comes out that I don’t want to deal with. I find that leveraging the Buddhist Temple early and often is essential for managing the ghost population, and I did not start to have success against the game until I started doing so regularly. My personal suggestion for which monk can best utilize the Buddhist Temple is the blue monk with the Second Wind power. This allows the blue monk to collect both tokens simultaneously and then potentially deploy them simultaneously, if on a corner, on a future turn. If the temple is located on a corner, then this is the best possible situation, as the blue monk can enter a cycle of exorcising both ghosts, placing statues, and then picking up any used statues on a later turn. You can use the Pavilion of the Heavenly Winds to move troublesome ghosts, such as ghosts from full player boards, onto a placed Buddha statue to instantly exorcise them, without the benefit they provide or punishment they impose when exorcised normally. • If you find your player boards are becoming full or if you have one or more player boards already full, do not hesitate to use a Buddha statue to exorcise low-level ghosts with the ability to add another ghost when placed, such as Sharp-Nailed Mistresses or Coffin Breakers. Although very easy to kill, an unlucky draw can lead to a chain of these ghosts being deployed, causing player boards to quickly become filled. • If you are having a problem with Haunters, then place or move Haunters closest to haunting a tile onto the statues. The same goes for ghosts that haunt the first village tile in front of them when initially placed, even if they are not Haunters themselves, such as Shapeless Evil. • If your player boards are well managed and not in danger of becoming full, and you do not have problems with Haunters, only then would I suggest placing ghosts with the ability to deactivate powers and Tormentors onto the Buddha statues. Blocked powers are always a serious problem, as you will find how critical those powers are when you are unable to use them. Tormentors can quickly become a problem even on well-managed boards, though I would generally suggest exorcising them normally, if at all possible, since they all provide a Qi or Yin-Yang token when exorcised. Note that Tormentors on the green board can be ignored if the green monk has the Strength of the Mountain power. One final note that I alluded to earlier is that I have found that some people play the Buddha statues incorrectly. Per the instructions, Buddha statues can only be placed on the turn after they are acquired, which prevents the game from being too easy. It’s easy in this game to make the mistake of fighting too often, hoping for a specific die roll you need. Even including wilds, any given die has only a 1/3 chance of giving you the color you’re looking for. With the typical 3 dice, that means a 70% chance that you’ll get at least one useful result, but only a 26% chance of getting two, and less than a 4% chance of getting all three. Sometimes you need to kill a ghost right away, but whenever practical, try to get enough tao tokens to guarantee a victory first. You don’t lose the extra tokens if you happen to roll well, but they’ll save you from wasting your turn if you don’t. Even a 30% failure rate adds up fast if you keep doing it over the course of the game. If you’re 2 tokens short before the dice, it’s rarely even worth the attempt; visit the herbalist or tea shop instead. With 4 dice (green’s power), odds improve to 80% for 1+ dots, 41% for 2+ dots. With 3 dice and a reroll (green’s other power), it’s 91% for 1+, 58% for 2+. With 2 dice (if one is trapped), 56% for 1+, 11% for both. If you’re fighting 2 ghosts and need 1 each of 2 different colors, odds are 19% with 2 dice, 41% with 3 dice, 58% with 4 dice, 69% with 3 dice and a reroll. If you’ve played this game at all, read any reviews, watched videos, etc. then you know, ghost stories is hard. It’s hard to learn, hard to win, hard to remember the rules, and on and on…..in the beginnning. When I first started playing, I got discouraged. This game seemed so complicated and impossible to learn. Then after I started to figure it out (finally! ), we’d just lose over and over. I still liked it, but it was frustrating sometimes. I thought it seemed ridiculous anyone would ever play it on any level other than initiation, because that was already unbeatable!! But the more you play, the more you learn, and you do start to win. Not every time, but sometimes. So, just give it time. Don’t play it once or twice or even 10 times and just give up. You’ve got to really give it a chance before making a decision. If that sounds like too much effort, maybe this game isn’t for you- it’s definitely not for everyone. But if you can give it time, you may find that your opinion will change, and it may become one of your favorites! If you lose your last Qi because your board is full during your yin phase, you also lose the opportunity to act during your yang phase, effectively costing you a turn. If you spend your last Qi to use the Sorcerer’s Hut, then it’s possible for an ally to revive you before your next turn, so that you lose no time at all. The Graveyard gives you back 2 Qi for the cost of a single player action plus a curse roll, which is actually a pretty good deal (especially if you can arrange for the green monk to revive you, since he will be either resistant or immune to the curse). Don’t be afraid to spend your last Qi…just make sure someone is standing by to revive you, first! The Sorcerer’s Hut and the Buddha spirit traps can automatically destroy a ghost regardless of its strength. You might think this means you should use them on the strongest ghosts, but you often shouldn’t, because the strength-4 ghosts also give sizable rewards if you fight them normally. The strength-3 ghosts with no rewards and the strength-2 ghosts that curse you when they depart are both excellent targets (though the latter can also be handled effectively by the green monk, who is either resistant or immune to curses). You should sometimes kill these with the sorcerer even if you have the tao tokens to exorcise them normally; it can be more efficient. The buddha spirit traps can also stop ghosts from using their arrival abilities, so you should trap the Shapeless Evil (haunts a tile immediately) and any ghost that triggers another ghost draw, whenever possible. It may feel like a waste to use them on a strength-1 ghost, but preventing the second ghost draw effectively buys you another turn, which you can use to reset the trap. 1. If you’re planning to fight a specific ghost and you don’t yet have enough tao to guarantee a victory, choose that color. A bird in the hand and all that. 2. Otherwise, try to build up a lot of tao tokens in a single color that other players don’t have. This generally means you won’t need to move around as much in order to spend them, and increases the odds that someone can handle a strong ghost when it shows up. However, you shouldn’t usually have more than 3 tokens of a single color. 3. Try to avoid taking two colors that are positioned at opposite sides of the board, as this will make it harder to spend them both. 4. When in doubt, take the color with more remaining tokens in the supply. This reduces the odds that someone will be unable to take a token at the Herbalist Shop due to rolling a color that you’ve run out of, or that you’ll be unable to set the Circle of Prayer to a desired color. 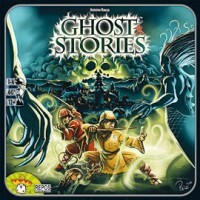 Ghost Stories is tough to win on the easiest level. When we play, we tried pulling some of the toughest ghost cards from the deck. Rather than pulling the specified number of cards randomly, take some of the super challenging ones. Having easier ghosts during your first few rounds of Ghost Stories helps ease the frustration of learning the icons on the cards. The yellow, green, and blue taoists all have two different and useful abilities. The red taoist really only has one ability (give someone a free move each turn), with the restriction that one side of his board only targets himself and the other cannot target himself. That’s kind of a let down, and the side restricted to self-targeting isn’t nearly as useful as the other. This gives red two genuinely different abilities that fill a similar strategic niche, like the other three taoists have (in this case, the niche of reacting more quickly to threats and preventing players from wasting turns because they aren’t close to anything). Each of the powers has some situations where it is preferable to the other, and based on my experience, they seem to be closer in overall power than red’s official abilities. I highly recommend this variant you can get at Artscow (link below). It’s meant to be played with White Moon, but you can take those cards out. This is one of my favorite games, and its always nice to add some new twists. The 54 cards in the expansion include 24 Yin-Yang cards, 12 Animal Totems and 18 Chambers of ****. Check it out! One of the loss conditions is 3 village tiles haunted. Tiles generally get haunted as the result of a haunter ghost, which you will have the opportunity to see coming at least a round in advance. Therefore, when tiles you don’t urgently need are haunted, you may be tempted to leave them until you actually need one of them or you see a third haunting is imminent. Try not to leave more than one tile haunted at a time, to give yourself a buffer. For players looking for a more challenging alternative to the solo game described in the rules, setup the board for 4 players and play the game according to the standard 4-player rules. The neutral power tokens are not used in this variant, as they are not part of the standard 4-player game. This version makes the solo game more strategic than tactical, and advanced planning is a must for survival. One suggestion for success is to review the entire play area before starting and ending each monk’s turn, which is especially important for Haunters and Tormentors, as this forces the player to be cognizant of the game state before committing to actions or developing forward plans. It is easy to get focused on a particular monk’s upcoming turn and then lose to a bad roll from a Tormentor leading to a third haunted tile. I find that placing weaker ghosts, specifically those with a resistance of 1 or 2, on the corners is the best method for keeping boards clear. When a monk rolls Tao dice while on a corner tile, the results can apply to ghosts on both of the boards touching that tile. As such, you improve the probability that you will roll the color of dice necessary to get rid of at least one of those ghosts, and, with the right roll(s) and/or Tao tokens, possibly both of them simultaneously. Stronger ghosts, which require a more focused assault due to their higher resistance, are no more easily cleared in the corners than elsewhere, so they should be kept towards the middle tiles whenever possible. Once you defeat the incarnation of wu-feng (red cards), you win the game! Assuming you haven’t met one of the other conditions first (3 haunted tiles, all the monks are dead, no cards are left in the ghost draw pile, etc.). Like I mentioned, this sounds so obvious, but we played 8 or 9 games before figuring this out. Because there are so many rules to learn, and winning is not a common occurrence, by the time we actually made it that far in the game without dying, I had either forgotten or overlooked that rule. It wasn’t until I played the iPad version that I realized we didn’t have to exorcise every single ghost in the deck!